Dragons flock to the caverns of Shinryu’s Lair. You will encounter big ones, small ones, red ones, blue ones—all manner of dragons. Bring any Dragon Lances you have acquired along your journey. If you haven’t gotten at least a couple you can steal them from the Crystal Dragon within the Lair. The Crystal Dragon is scarce in the Entryway, but once you get to the Treasure Room (I like the sound of that!) and Shinryu’s Roost he shows up more frequently. Other methods of effectively killing dragons include the Dragon’s Whisker (dropped by the Stingray) which deals critical damage to dragons. The legendary Apollo’s Harp (released from Kuza, the Sealed Castle) inflicts critical damage to dragons and undead. Also worthy of mention (and it may come in handy against Neo Shinryu) is the Dragon Cannon, created with the Cannoneer’s ! Combine ability using a Dragon Fang and a Blitzshot. Dragon Cannon also inflicts critical damage to dragons. There is also a new dragon roaming the halls in the Treasure Room and Shinryu’s Roost: #240 the Claret Dragon. He may not be new to you. There is a slight chance you ran into him in Abyssal Falls’ Treasure Room. If you meet up with the Claret Dragon be sure to cast Shell or Mighty Guard on your party. He casts Flare when he dies. In order to thoroughly explore Shinryu’s Lair you need either a geomancer, someone with the Light Step ability equipped, or a freelancer who has mastered the geomancer class and inherently gained Light Step. Dragons enjoy lava. Before we go tromping through the glowing hotness, let’s grab the only treasure on the floor that doesn’t require waders. Walk north from the entrance. Turn right at your first opportunity. Don’t take the stairs either up or down. Keep going to the right. When you see the switch on the wall ignore it. Pressing it opens up a trapdoor that drops you down to the treasure room. Maybe I will let you press it after you collect this treasure. Follow the path around to the north and run up to the treasure chest (if you are still capable of running this late in the game). Gingerly remove the Elixir from the chest. Now, go back and press the switch. Act surprised when you fall through the floor. Walk right just a little from where you land. 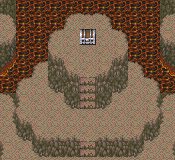 Then walk south when you see the jut of land and the stairs descending into the lava. We’re going down there so make sure somebody has Light Step. Once in the lava head west and then south around the treasure island. When you come to the stairs you know what to do. It’s dragon hoard looting time! From left to right the bottom row holds these treasures: Phoenix Down, Blitzshot, Elixir, Blastshot, and Ash. Once you have gotten those it’s on to the top row! From right to left those chests contain: Flame Scroll, Ash, Maximillian, Lightning Scroll, and Flame Scroll. Most of the treasure was a little disappointing. I don’t know what the dragons’ fascination with scrolls is. But you did walk away with the second strongest armor in the game. The Bone Mail is still the strongest. But the Maximillian with its 27 def is a close second. It raises def 5 points higher than the Genji Armor . It also raises mdef by 5 points. It weighs in at 9, the same as the Genji Armor. Unlike the Genji Armor, the Maximillian doesn’t protect its wearer from any status effects. Though it does boost stamina by 2 points. With your treasures tucked away, wade into the lava and go back to the stairs over to the east. Climb out of the lava and walk west all the way around the treasure island. Exit at the door. There is nothing of interest to the east. Only one treasure chest perches in this room. Don’t be hasty opening it. Neo Shinryu waits inside the chest. If you need to gain abp before attempting Neo Shinryu this is a decent room to do it in. The Claret Dragon appears fairly often and yields 30 abp. Couple that with the ABP Up ability and you will have the abilities you need in no time. If you want more Dragon Lances, you can steal them off of Crystal Dragons in this room as well. Once you have prepared tiptoe up to the chest high on the ledge and steady your hands as you turn its key unleashing the evil inside Pandora’s Box. Neo Shinryu operates much like his cousin Shinryu (classic). They look alike. They cast a lot of the same spells, and you can exploit their weaknesses the same way. I still rely on Dragon Lances as my primary killing weapon. I know they are ridiculously hard to come by, but there are many Crystal Dragons in the room with Shinryu. I ended up with four Dragon Lances for this fight without resorting to endless stealing and casting Return. I have killed him with only two before. Dragon Lances are not the only method to beat Neo (as you can see by the comments left by others who have defeated him), but using them is quick and effective. While Neo Shinryu utilizes the same attacks as his cousin Shinryu (classic), he is not as methodical. He does not begin the battle by casting Tidal Wave. He begins the battle instead by casting Mighty Guard. I usually begin the battle doing the same thing. Coral Rings may not be in your best interest for this battle. Neo still casts Tidal Wave, but much less predictably than his cousin. He casts other elemental spells, Ice Storm, and Lightning with more frequency and the Coral Ring renders its wearer weak to lightning-elemental damage. If it weren’t for rendering the wearer weak to water-elemental damage I would suggest Flame Rings. Neo’s vast arsenal of attacks makes it impossible to prepare for all scenarios. All you can do is cross your fingers and plan a bit. I use two healers and two mêlée fighters. My mêlée fighters both use the freelancer job. In fact they are identical to one another. Each has mastered level 5 time magic so they can cast quick, and each employs the ! Jump ability for a “death from above” tactic. These two wield the four Dragon Lances. If you don’t have enough Dragon Lances, it would be good practice to give a fighter one Dragon Lance and the Force Shield (assuming you have beaten Omega Mk.II). You can substitute other weapons for the Dragon Lances, but the difference in damage is staggering. Dragon Lances hit for 7,000 to 9,999 points of damage. The Longinus only musters about 1,000. I have whichever fighter goes first cast Quick and then use the two turns to cast Hastega and then Jump. I prefer casting Hastega rather than equipping Hermes Sandals. The next fighter then casts Quick and Jumps twice. The spellcasting characters allow a little more customization. As a general rule I use mimes for spellcasters. I give one spellcaster ! Blue and Equip Katanas (so she can wield the Masamune and go first). I use her to cast Mighty Guard as quickly as possible. I suppose I could use a freelancer so I didn’t have to resort to using an ability slot to equip something. The final slot is your choice. I like adding the Cannoneer’s ! Combine to create a Dragon Cannon (Blitzshot + Dragon Fang). I don’t think it does enough damage to be a staple fighting move, but it causes between 4,000 and 9,000 points of damage. Jumping with Dragon Lances inflicts about double that. I employ the second spellcaster as a healer. She gets ! Dualcast and ! White. The third ability is personal preference. The chemist’s ! Mix ability is not a bad idea. You can mix together an Ether and a Dragon Fang to make Dragon Shielding. Dragon Shielding is almost like a light version of the Force Shield. It nullifies fire- ice- and lightning-elemental attacks. It won’t protect you if he casts Tidal Wave, but it nullifies Ice Storm, Lightning, and Blaze. If you opt for a more offensive healer you can give her ! Black and ! Dualcast Flare when you have a spare moment. I enjoyed having a freelancer healer and giving her Apollo’s Harp. Whenever she wasn’t healing I had her whallop Neo for about 5,000 points of damage. As for equipping your ragtag bunch, use as many Ribbons as you can. I usually only give them to my fighters. Ribbons may save you from White Hole, Poison Breath, Mute, and from some of the effects of Curse. Unfortunately his Curse once turned my fighter Lilliputian. The Ribbon doesn’t help with mini status. My spellcasters shun Ribbons in favor of Gold Hairpins. What’s a little status problem to someone versed in Esuna? Armor is always personal preference. Find a good home for the Vishnu Vest. Obviously give it to someone who isn’t carrying the Force Shield. Mirage Vests may come in handy because Neo Shinryu does smack you around on occasion. My spellcasters wear flowing Black Robes because you cannot go wrong with +5 mpwr. Free hands should contain either the Force Shield or an Aegis Shield. Usually I can tell you just what accessory to wear to the fight, but Neo Shinryu has me perplexed. There is no clear winner as far as Coral Rings, or Flame Rings are concerned. Coral Rings are still appropriate because if he does cast Tidal Wave it can inflict 2,000 to 8,000 points of damage. If you fear Zombie Breath slide on some Angel Rings. There is such a slight chance you will be zombified I don’t wear them. I would rather cast Hastega than wear Hermes Sandals. The Sorcerer’s Mantle does not work as advertised. The description says it nullifies all elemental attacks. I think it’s busted. Regardless it has a 10% evd and a 20% mevd so it may still be worth wearing. There is always the old standby Protect Rings. Regen is never a bad thing. For reasons unbeknownst to me, Neo Shinryu switches back and forth between complete invulnerability—your attacks will not even register zero damage—and being decimated by whatever you hurl at him. I have no idea when he is immune to damage and when he is not or why. Just keep trying and eventually you will score a hit. Your game plan then is to cast Mighty Guard (In addition to its wondrous Protect and Shell, you want to be floating in case Neo Shinryu casts Earthquake). Cast Quick. Cast Hastega. Jump. Repeat casting Quick and Jump. Heal when necessary. Since Neo likes to follow up Mighty Guard with Mælstrom on single or multiple targets you may be doing a lot of healing. Unfortunately Neo Shinryu cannot just die like any other monster. He casts not one, but two spells when he dies. I hope you still have Mighty Guard going when he dies because he casts Gigaflare and follows it with Meteor. At least when you see Gigaflare you know that you’ve won. After all of your toil you are rewarded with 150 abp and the lovely Advance only Ultima Weapon. The Ultima Weapon is the strongest weapon in the game. It boasts 180 atk. That is a full 30 points higher than a Perfect Brave Blade . It also increases str, agi, and sta by 2 points. Having felled the dragon and stolen his treasure there is only one more place to venture. It is time to leave Shinryu’s Lair, go back to the Hall of Tranquility in Abyssal Falls and use the warp point (after saving at the consecrated circle of course) to Lethe Court. Beaten with team as follows: Bartz: Lv76 Freelancer; Jump, Time; Dragon Lance, Force Shield, Ribbon, Maximillian, Hermes Sandals Faris: Lv76 Freelancer; Combine, Time; Dragon's Whisker, Genji Shield, Ribbon, Vishnu Vest, Coral Ring Krile: Lv76 Mime; Dual Cast, Black, Combine; Dancing Dagger, Ice Shield, Gold Hairpin, Black Robe, Flame Ring Lenna: Lv75 Mime; Dual Cast, White, Combine; Mace of Zeus, Ice Shield, Gold Hairpin, Black Robe, Flame Ring. Weapons were chosen to inflict damage or increase magic; armour items were chosen for complementary defences. All were initially floating. I made use of Quick and Dual-Cast; the first action was Quick, followed by Hastega then Jump (no Mighty Shield; with that, I'd have foregone the initial attack). Jumping and Dragon Cannon caused 9999 damage each; Flare caused around 6000. The Dragon's Whisker didn't actually get used. Slowga (sometimes) works, though I do not know for how long. I put Mimic to use firing off cannon shots; I would also have done so with dual-cast flares were other things not needed. if you need elixers you can steal them from Crystal Dragons asa common steal. equip flame sheilds and coral rings on everybody. HELLO! please someone help me out i killed neo shinryu but i cannot warp to the next zone PLEASE HELP!! what can i do? forget the dragon lances and get the ability !equip harps tou use "the legendary apollo�s harp" it does from 8000 to 9999 damage. use hermes sandals i all your party members, ice shields and the force shiel in a mime with white, time and dualcast. heal as necesary, use quick at necesity too, when all your party members are down and you need 3 arise spells. mighty guard is essential. also you will need the mix ability for an especial combination of phoenix down & antidote called resist ice, and give it to the one with the apollo�s harp. golem is usefull, neo shinryu attacks for 1600 t0 2300 damage. be careful because when his hp reaches 0 wil cast gigaflare & meteor. good luck! Neo Shinryu's random bouts of invincibility aren't entirely random. There are in fact one or two (I can't remember exactly how many) 'dummy' targets, which cannot be harmed AT ALL. The damage won't even register, and I believe that they're purely there as a counter-measure against !Rapid Fire. The above also applies to Neo Exdeath and Enuo. Dragon cannon is the cheapest and most effective way to damage him for me. Well he was simple too. Equip the force sheild ( this is quite usefull ) and put !Dualcast, !Black and !White. Firts of all cast dispel on Neo Shinryu to dispel his mighty guard. He will not cast this spell twice. And until the end of the fight, cast flare twice to deal about a total of 14,000 points of damage. When a caracter is ko cast arise and flare in the same dual spell . When he cast white hole, cast arise and esuna to heal him completely. After continu with flare spell. He should go down easely . When he have 0 hp he cast mega flare and meteo. If you have a caracter that have 9999 HP you should be ok. Yes, there is. -Fuma Shurikens do about 6,000-7,000 to him. While they may miss, they can kill him quickly. You can avoid having to use multiple shurikens by using Mime. -The Chemist Mix Dragon Breath does exactly the user's current HP in damage. This bypasses his defense statistic. Unfortunately, his attacks are devastatating- see my post in his Bestiary listing for more information on them- but you need the Force Shield and Gold Hairpin on someone who can double cast in order to recover from them. Quick is also good, as it allows you to cast 5 times per round; you can cast Arise on the other three people and use the other two castings however you wish. I haven't tried to beat him entirely without Dragon Lances, but I did do it with only two. Is there any way to beat Neo Shinryu without going through the hell of stealing Dragon Lances?